The digital weather alert that sits by the bed let out a screech that could wake the dead at about five o’clock this morning. I was already awake and figured it would go off at some point. All night the house shuddered from the sonic booms of thunder along with lightening that flashed in the windows like a blinking lighthouse signal. We were pelted with rain and rounds of hail that bounced off the metal roof and the air conditioner in the bedside window that Sonny never had a chance to remove before winter. That’s ok it’s ready for the August heat wave that is sure to come later this summer. The weather alert informed me that we were under a tornado watch until one o’clock this afternoon. I decided I might as well get up and get dressed. If a tornado came through I didn’t want to be blown away wearing my jammies. I’d would rather look respectable while swirling in a windy tunnel. It would be better if I could ride my bicycle through the air with Moby in a basket on the back, or row in a boat. I just don’t want my house to land on a witch wearing striped socks. I’d rather not take that trip at all. Mother nature finally ended her temper tantrum but continued to stay in a black mood and cried all afternoon. It was a big change from her sunny and warm disposition of the past few days and her foul mood today put us all in the dumps. Yesterday I was able to pull up the dead petunias out of the front flower bed and clip back my purple irises. I went ahead and planted a couple of thornless black satin blackberry bushes that Sandy from Two Lynnes Farm had given me from her garden. We will see if they survive. My spring bulbs are busting through the soil and I saw some blooms of yellow crocus peeking through the mud. I’m sure Mother Nature will have a few more angry outbursts, she always does when the seasons change. We just have to be prepared for them. Our busy weekend started Thursday with our involvement with Matt Sherald of PIMBY Services. A couple of months ago Matt asked if we would like to be on the panel for Off Grid Living at a Small Farm Conference sponsored by WVU’s Extension Services. It was a good presentation and we had quite a few questions asked from the audience. We headed out from there and got back home with enough sun light to fire up the chain saw and start clearing the swamp trees that have grown up in our east pasture. We dropped about 15 mid sized trees before it got dark. On Friday we headed out to Tyler Feed to pick up some scratch and laying mash. We used to go to Tractor Supply but Tyler Feed offers scratch and laying mash ground from local farmers corn and oats. We would rather support our local farmers. On the way home we stopped by Two Lynns Farm for a visit. They are preparing for Maple syrup season. Lynn took me for a ride around his property parameters on his four wheeler. He is a Jack of all trades and a heck of a entrepreneur. He and his wife Sandi make maple syrup, hatch and raise chickens and guineas, milk and beef cows, and horses. He has a small saw mill and creates wooden bowls and plates with his lath from interesting pieces of knotted wood he finds on his property. We decided that next month we were going to get a few more hens and guineas. 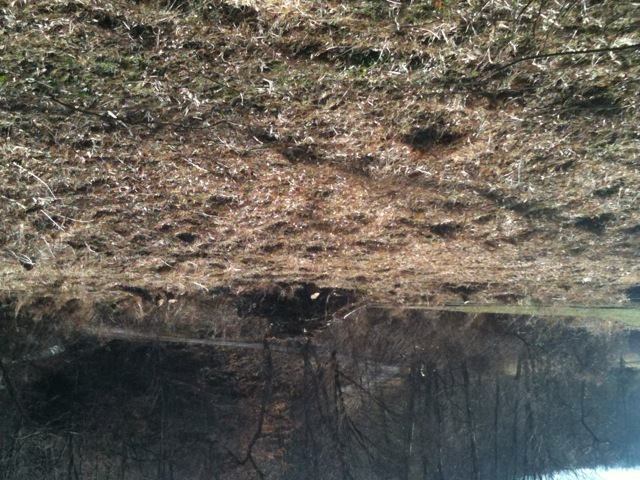 Today we spent most of the day clearing the trees and branches that we cut down on Friday. I cut them in 10′ lengths and used the tractor bucket and a chain to stack them for later cutting while Linda created a giant pile of brush. 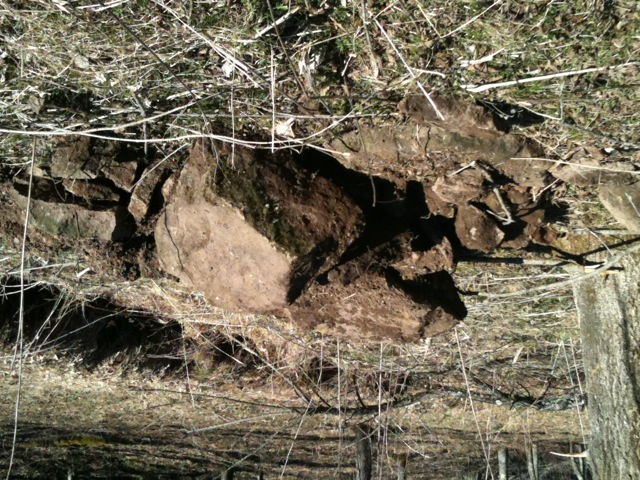 I plan to bush hog it next week and get ready for the fencing project that will come shortly. Were ready for dinner now. We dumped a hodge podge of Great Northern, black beans, pork-n-beans, tomato sauce, onion, garlic, green pepper with a load of hamburg and sausage into a lodge pot and it has been simmering for the last few hours. I’m hungry. 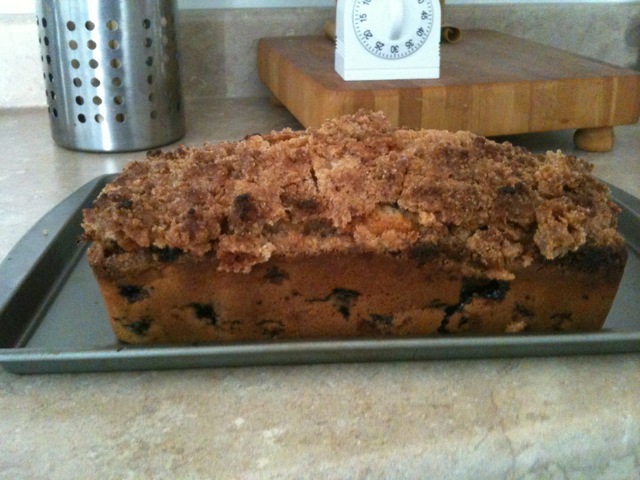 Blueberry Buckle Coffee Cake, DELICIOUS! The other day I wanted to use up some blueberries I had frozen in the freezer. I thought about making a couple of different recipes but when I looked them up found that I was missing a few of the needed ingredients in my pantry. So the next best thing was to go to the internet of course and wallah…I found a recipe for a coffee cake that I have never tried or even heard of before. It turned out to be delicious. So I thought I would pass it on to you. It might be fun to see how it would turn out in our solar oven sometime. Always a new experience here at PHF. Rinse blueberries in a colander or sieve in cold water, no soap. Remove any stems or mushy berries. Preheat oven to 375 degrees. Combine sugar, baking powder, salt and cinnamon in a bowl and mix well. Add 1/4 cup softened butter (or shortening), the egg and mix with a hand mixer or spoon. Add 1/2 cup of milk and mix. While mixing stir in the 2 cups flour. Add blueberries and gently mix trying not to crush too many berries. Grease and flour a 9″ deep dish pie plate or 2 small meat loaf pans, a bread loaf pan or round casserole dish. Pour batter into pans. It should only fill the pan about half way. The batter will rise when baked. Mix topping ingredients together then sprinkle over cake top and bake in 375 degree oven for approximately 45 minutes. If you use a loaf pan like I did it will take about 10 minutes or so longer. Enjoy! This morning was beautiful with sunshine and temps up around forty degrees. By afternoon the skies darkened to a steely blue grey and the winds began to blow down through the holler. Although the temperature remained the same there was a chill in the air that cut clear through to your bones. Since it was nice this morning I let the chickens out from the coop. It looked like a good day to get some air and exercise. They happily clucked around the farm along with the guineas picking at the green grass that has finally been uncovered from the last snow. Everything was calm, serene, the hens crooning and singing until the sun hid behind ominous clouds and a hawk swooped down from them on a cold wind. I was in the house perusing the seeds we had ordered for the garden. I heard a loud thump as if a car door had been slammed closed and Ruby began to growl. We were waiting for a delivery from FEDEX and so I thought it may have arrived. Stepping out onto the porch I didn’t see anyone but could hear the rooster making a ruckus down at the pole barn. I knew something was after the chickens and then I heard a screaming sound coming from the wood shed. I saw a flutter of feathers and thought it was an owl but realized they wouldn’t be out this time of day. It must be a red tailed hawk. I ran to the side of the wood shed making sure I didn’t stand directly in front of the opening. I took my hand and banged it against the metal side hoping it would scare the hawk and it would fly out. It did. Inside the shed I found one of my buff colored hens squished as far as she could get between the wood pile and the wall. I picked her up and held her in my arms. She was shaken up, her little heart beating wildly against her breast, but appeared to be completely unscathed. I tried to comfort her and carried her to the coop. When I opened the door there was all four guineas hiding in the hen house. They have never been in there before, I guess it was the closest place to take cover. All the other chickens were in the pole barn hiding behind boards and sheets of metal leaning against the wall. The rooster stayed on guard and paced back and forth ready to sound an alarm if the hawk returned. A little later I peeked out of the window of the house and saw a Rhode Island Red hen high tailing it across the yard as fast as her yellow legs could carry her towards the pole barn. She must have been hiding under the car. I’m not sure, but I think the chickens might have four of their cousins staying for a visit in the coop tonight. So far no one has wanted to move from their hiding places. Its inevitable that we will lose some of our animals to predators and we would have today if I was not home. Its life on the farm, but I’ll protect my farm animals if I can. The red tailed hawk is a beautiful creature, but he better go hunt mice and rabbits and leave my birds alone or he may lose a few feathers of his own. I know that our blogs have been sporadic this winter, but hang in there we are gearing up for spring and a lot of projects are on the to do list. So things will be picking up and we should have a lot to share with you. Thanks for the prayers for sunshine, God must have been listening because we have had a few gorgeous sun filled days since then. It was ten degrees outside this morning when I went out to take care of morning chores. The clouds hung like heavy gray drapes across the sun. Another cold dreary day lay ahead for this off grid girl. The guineas were hunkered down in the pole barn. Even they didn’t want to venture out. They know me now and make soft squeaking noises, as soft a sound as guinea can make, when they see me coming with a can of corn scratch. Their water bowl looked like ice cube trays that have been in the freezer too long. You know the kind, no matter how you twist the trays, beat them against the sink, or grit your teeth they aren’t coming out and when they do they shatter into chunky shards. We use the black rubber feed bowls and I can usually twist and press on the sides a little bit to free the block of ice water inside. Not happening today. I had to poke it with a tool handle to break it up. If I had some flavored syrups I could have made Italian ice cones for the guineas. The chickens water bowl wasn’t as frozen but the flock was upset with a case of cabin fever or should I say coop fever. The rooster sounded like he was crowing “let us out” in my left ear the entire time I was feeding up, while the hens surrounded my feet and pecked at the snow on my boots. Too cold for them to be out today. Sweep the snow off the panels, turn on the generator, carry in a few loads of wood and I was ready for breakfast. The rest of the day was spent sitting by the wood stove, keeping it fed and reading or playing scrabble on the computer. It’s too cold to do anything. I have a million projects I could do, but I think I just need some warm sun on my shoulders and the sight of some green grass, anything but grey skies and white snow. I need some bright color. Even the dog is unenthused. Moby did try to cheer me up today. I found his gift of a mauled frozen mouse laying on the rug at my bedside. I’m not sure how he got it past me when I let him in. Maybe Ruby was an accomplice to the surprise. I’m just glad he didn’t decide to hide it with the POW crinkle balls. Well, it’s time to get back to that book and a cup of hot chocolate. Brighter days are ahead. It’s that time of year we all look forward to with such excitement. 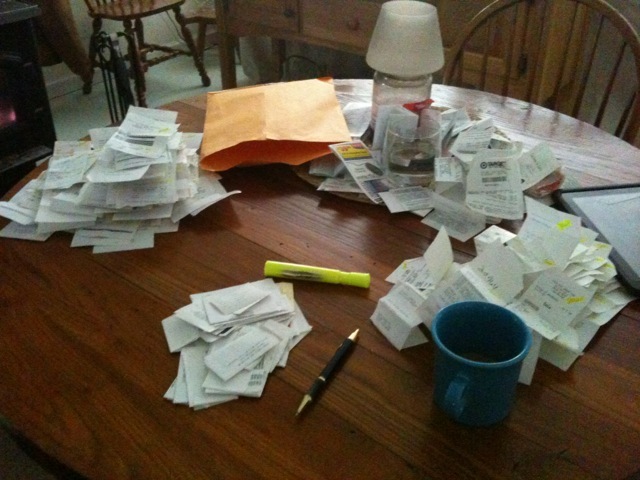 Its a time when those of us who itemize bring out the boxes of receipts that have been accumulated through the year. Such a grand time it is to spend your afternoon separating, labeling each and every one, most of which are so faint that you can barely read them, because the gas stations and restaurants are too cheap to change the ink cartridge in their cash register or whatever it is they use. Charcoal would be more readable. Total them up three or four times and your finished. The CPA can do the rest. Hopefully we won’t owe any more than we have already paid in, but you never know. That’s the excitement of it. It’s a waiting game. Did we break even, win a prize, or do I owe my kidney? 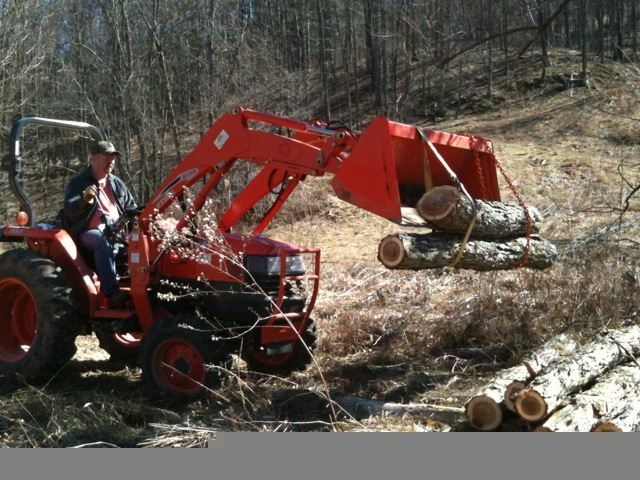 You are currently browsing the Off-Grid in West Virginia blog archives for February, 2011.